A small icy body in the Solar System, with a solid nucleus of rock, dust, ice, and frozen gases such as carbon dioxide, carbon monoxide, and ammonia. A small icy body in the Solar System, with a solid nucleus of rock, dust, ice and frozen gases such as carbon dioxide, carbon monoxide and ammonia. Comets are believed to originate in the cold, dark outer reaches of the Solar System, and only when their highly elliptical orbits bring them close to the Sun, and frozen gases begin to boil off, can we see them. 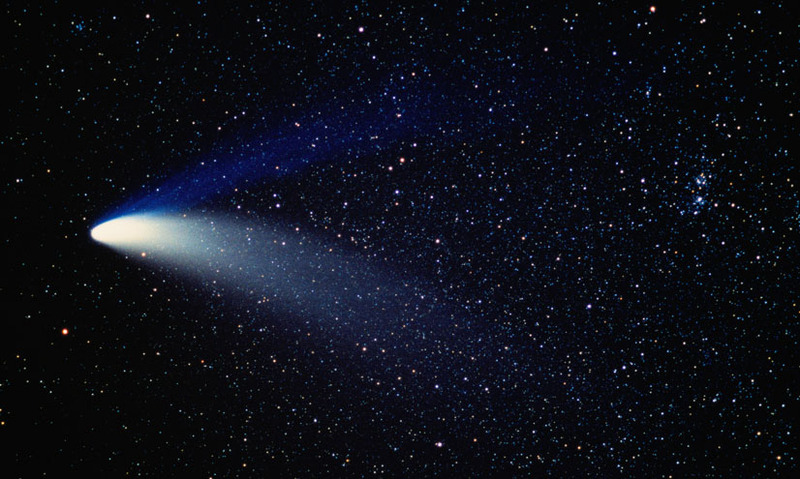 Comets are believed to originate in the cold, dark outer reaches of the Solar System, and only when their highly elliptical orbits bring them close to the Sun, and frozen gases begin to boil off, can we see them.